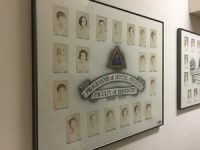 It is hard to believe 50 years has passed since the inaugural dental hygiene class commenced at the University of British Columbia’s Faculty of Dentistry. This year, 2018, marks a golden milestone. Come celebrate with us—the Faculty, the university and the province—as we honour the history and aspire for the future of dental hygiene education at UBC. Take a trip through the following timeline to discover how it has unfolded in these first 50 years. First dental hygiene diploma class graduates. The dental hygiene clinic is located on the first floor of the John B. Macdonald Building. This is an isolated location away from the main clinic for dental students, which is above on the main floor. Despite the separation, creative ideas to combine dental hygiene and dental students in classes and the main floor clinic help establish a solid tradition of the two groups learning and practising together. 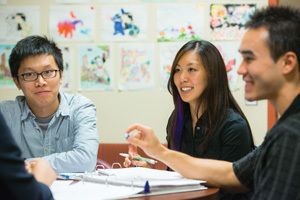 Recognizing a need for advanced education in dental hygiene to fulfill requirements for dental hygiene educators, public health supervisors and researchers, the Faculty of Dentistry starts discussions to convert UBC’s diploma program into a degree program. Two proposals are presented to the Faculty Council, but neither are approved. 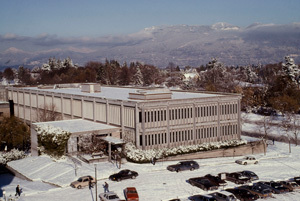 UBC’s dental hygiene diploma program is discontinued following the university’s 1984 change of mission to offer only undergraduate degree programs. 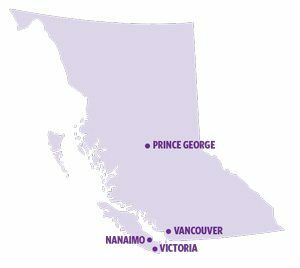 Subsequently, several community colleges in British Columbia (Vancouver Community College, 1986; New Caledonia in Prince George, 1989; Camosun in Victoria, 1989; and Vancouver Island University in Nanaimo, 2006) begin dental hygiene diploma programs, maintaining prerequisite transfer courses. 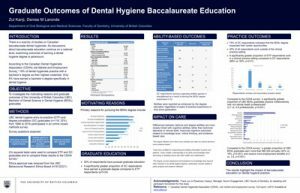 BC Dental Hygienists’ Association lobbies the UBC Faculty of Dentistry for a degree-completion opportunity for practising dental hygienists with a dental hygiene diploma. This coincides with UBC’s push for faculties to expand education program opportunities for women and to increase the number of programs that are offered. The proposed degree-completion program in dental hygiene receives approval of the Faculty Council and UBC Senate. Curriculum is developed collaboratively by Faculty of Dentistry experts in dental sciences and a broad representation of dental hygiene leaders in both Canada and the US. 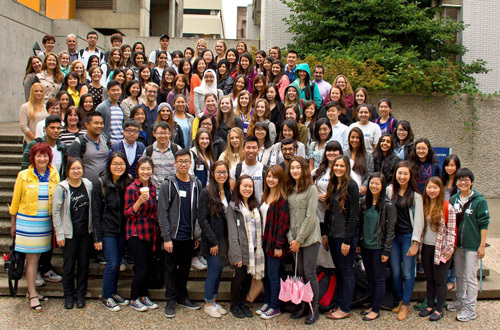 UBC’s Bachelor of Dental Science Program (Degree Completion) in dental hygiene starts, with two full-time and three part-time students learning on campus. Enrolment is limited at the request of the dean, to allow time to learn what impact this new program will have on Faculty resources. The founding program director is professor Bonnie Craig (1992-2015). Entrance requirements include one year of university prerequisite courses and a two-year dental hygiene diploma from an accredited program. The curriculum focuses on enhancing academic background, including dental, dental hygiene and social sciences. Clinic sessions are not included in the curriculum because students are already registered to practise, thus deemed competent. Some classes, such as microbiology, periodontology, oral medicine and oral pathology, are taken with dental students. UBC administration encourages faculties with small programs to increase enrolment or risk being discontinued. The dean of Dentistry, Dr. Ed Yen, asks the dental hygiene program director to explore possibilities for increasing enrolment in the dental hygiene program. No funds are available from UBC or the Faculty for this purpose. First dental hygiene degree completion class graduates, earning a Bachelor of Dental Science in Dental Hygiene degree, or BDSc (DH). Having a goal of increasing enrolment, no funding, and a revised dental curriculum that eliminated the class-based courses taken with dental students, Dental Hygiene submits a proposal to Distance Education for funds to create the first online course. 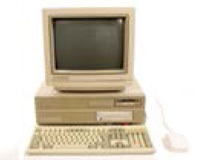 Dental Hygiene, in competition with other UBC initiatives, is approved for reformatting Oral Pathology to an online format. All degree-completion courses are offered exclusively through Distance Education. The decision to offer online courses only, while containing costs for the Faculty, results in the most flexible and accessible dental hygiene learning opportunities available across Canada and globally. 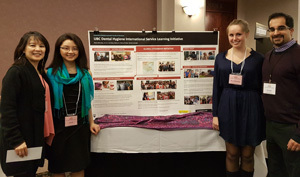 Enrolment exceeds expectations, with students from all over North America. Additionally, after much deliberation, the entry-to-practice (ETP) option is approved by Faculty Council and UBC Senate. First ETP class is admitted to undertake four years of full-time study. ETP provides a science degree and preparation for registration to practise as a dental hygienist. The first program of its kind in Canada, students could be admitted after secondary school or with previous post-secondary credits. 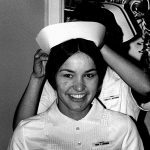 ETP curriculum prepares dental hygienists for enhanced community health roles, and many students know, when starting, they will eventually pursue graduate studies. As of 2008, nine degree-completion graduates had graduated with a master’s degree in Science (Dental Science), Education or Health Administration; two of them are now PhD candidates at UBC. 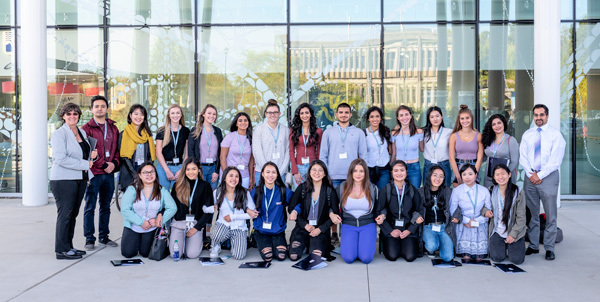 Also in that year, 11 dental hygiene graduates are studying in master’s programs at UBC, and at the universities of Toronto, Alberta and Idaho. Four other graduates are applying for programs in Science (UBC), Public Health (SFU), Distance Education (Athabasca) and Education (UBC). Four years of undergraduate studies in science combined with specific education to become a dental hygienist comes to fruition as the first class in the ETP option graduates, receiving the BDSc (DH) degree as their first dental hygiene credential. 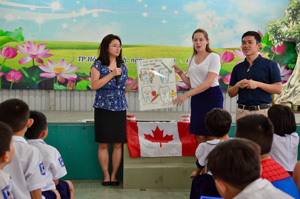 Committed to fostering global citizenship, the Dental Hygiene Degree Program commences dental hygiene international service-learning experiences, beginning in Vietnam. Working with various local health care professionals, fourth-year students and faculty provide instruction and preventive care for oral cancer patients, conduct oral cancer screenings, present seminars to students and health care professionals at hospitals and universities, and provide oral hygiene care to children at orphanages. Continuing its leadership position in dental hygiene education in Canada, UBC’s Dental Hygiene Degree Program is the first to integrate the newly published Canadian Competencies for Baccalaureate Dental Hygiene Programs. The Faculty document is augmented by adding “Scientific Investigation” as an additional competency students are expected to demonstrate. Also, in collaboration with UBC Health, the ETP option begins to develop, with 11 other health science programs on the UBC campus, interprofessional learning opportunities that are integrated in curriculum. Subjects include integrated ethics, e-Health and Indigenous cultural safety. Thirty-nine new dental hygiene students joined the Faculty of Dentistry in the BDSc (DH) Class of 2022. The class is composed of 26 in the entry-to-practice option who study on campus (23 of whom are pictured below on the first day of class, September 4, 2018) and 13 degree-completion students who study online. The Faculty of Dentistry is proud of all its dental hygiene graduates: 328 Diploma in Dental Hygiene alumni and 515 Bachelor of Dental Science in Dental Hygiene alumni (350 degree-completion and 165 ETP) to date. UBC looks forward to continuing its leadership role in dental hygiene education in British Columbia, Canada and internationally. Content courtesy of Dr. Zul Kanji, director, Dental Hygiene Degree Program, and Prof. Bonnie J. Craig, professor emerita, UBC Faculty of Dentistry.